Yesterday, we got the official synopsis for Godzilla Vs Kong. Today, it has been announced that the hugely anticipated brawl between two of the world's mightiest monsters has officially begun shooting. We also have a full cast rundown as well as some insight into how this is all going to go down. 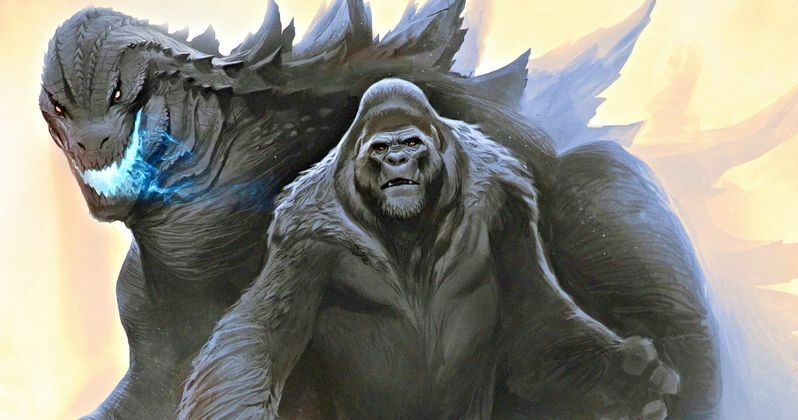 Following the global success of 2014's Godzilla and 2017's Kong: Skull Island, and in the lead-up to the 2019 release of the highly anticipated Godzilla: King of the Monsters, comes the next chapter in Warner Bros. Pictures' and Legendary Entertainment's cinematic Monsterverse: Godzilla vs. Kong. Beginning production today, the epic action adventure will pit two of the greatest icons in motion picture history against one another, the fearsome Godzilla and the mighty Kong, with humanity caught in the balance. Godzilla vs. Kong is being directed by Adam Wingard (The Guest, You're Next). The sequel has assembled a unique ensemble cast.The film stars Alexander Skarsgård (Big Little Lies, The Little Drummer Girl), Millie Bobby Brown (Stranger Things), Rebecca Hall (Christine, Professor Marston and the Wonder Women), Brian Tyree Henry (Atlanta, Widows), Shun Oguri (Gintama), Eiza González (Baby Driver), Jessica Henwick (Iron Fist), Julian Dennison (Deadpool 2), with Kyle Chandler (The Wolf of Wall Street, Manchester by the Sea) and Demián Bichir (The Nun, The Hateful Eight). In a time when monsters walk the Earth, humanity's fight for its future sets Godzilla and Kong on a collision course that will see the two most powerful forces of nature on the planet collide in a spectacular battle for the ages. As Monarch embarks on a perilous mission into uncharted terrain and unearths clues to the Titans' origins, a human conspiracy threatens to wipe the creatures, both good and bad, from the face of the earth forever. Wingard directs from a script written by Terry Rossio (Pirates of the Caribbean). The film is being produced by Mary Parent, Alex Garcia, Eric McLeod, and Brian Rogers, with Kenji Okuhira, Yoshimitsu Banno, Jon Jashni and Thomas Tull serving as executive producers. Jay Ashenfelter, Jen Conroy and Tamara Kent are co-producers. Behind the scenes, Wingard's creative team includes director of photography Ben Seresin (World War Z, Unstoppable), production designers Owen Patterson (Godzilla, The Matrix Trilogy and Captain America: Civil War) and Tom Hammock (The Guest, Blindspotting), editor Josh Schaeffer (Molly's Game, Kong: Skull Island), costume designer Ann Foley (Altered Carbon), and VFX supervisor John "DJ" DesJardin (Batman v Superman: Dawn of Justice, Watchmen). Filming is taking place in Hawaii and Australia. A presentation of Warner Bros. Pictures and Legendary Entertainment, Godzilla vs. Kong is currently scheduled for release on May 22, 2020. The film will be distributed in 3D and 2D and in select IMAX theaters by Warner Bros. Pictures, except in Japan, where it will be distributed by Toho Co., Ltd.